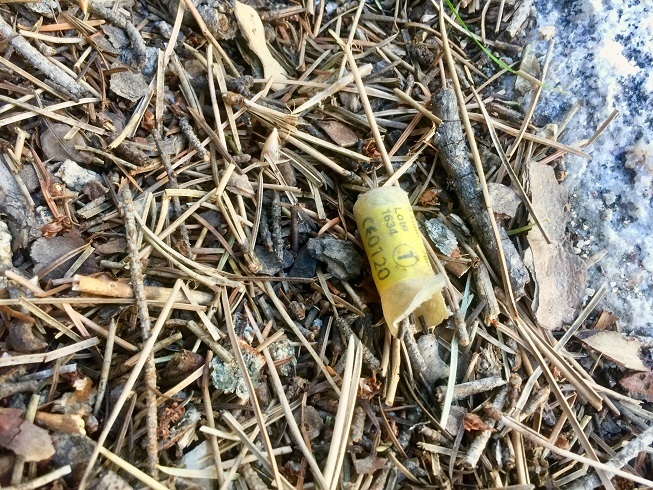 Micro-trash is certainly a common occurrence at crags and trails alike. The little bits of wrappers and tape are what most people brush off for how small and seemingly inconsequential they are. This type of trash is also the easiest to miss when packing up for the day. 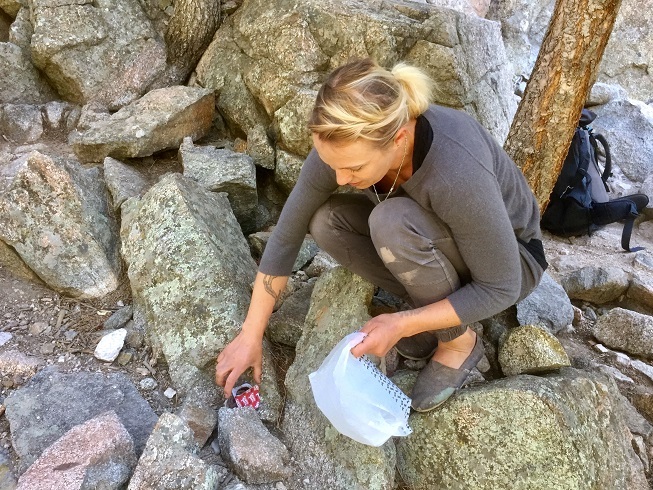 So, here are several ways for us to further engage with Leave No Trace practices and to ensure we don’t unknowingly contribute tiny, yet cumulative, waste. 1) Mark your gear with nail polish instead of tape. After a while, particularly with heavy use, those little bits of colorful tape will find their way to the ground, to ledges, into cracks. The gear is chewed up by the rock, exposed to dirt and grime, and so is the tape. With more surface area, tape is a vulnerable option for marking gear. Eventually, the tape will lose its ability to stick, is shredded, and will peel away, be at the whim of gravity, wind, or your own fingers as you subconsciously pick at loose ends. Nail polish is a more permanent solution to begin with, particularly when painted in areas less prone to wear. Nail polish versus electrical tape. 2) Remove the info tags from the ends of your rope. While it’s nice to remind yourself of the length of your rope, the thickness and brand, these plastic tags eventually do come off and become litter. Exercise your memory bank and leave those tags at home, or in the trash. An unlucky rope tag turned micro-trash. 3) Doggie bags should live in your climbing pack. Mini trash bags for picking up dog poop are conveniently small and easily stashed in your backpack. If friends or strangers are peeling oranges or cuties, surprise them with a doggie bag. Banana peels? Apple cores? Chocolate-covered bar wrappers? Crag-dog poop? Doggie bag for the win. And when you’re scanning the area during your habitual “spot check” before you leave, you’ll be able to pick up any micro-trash you see. Lenore Sparks picks up trash with her handy doggie bag. 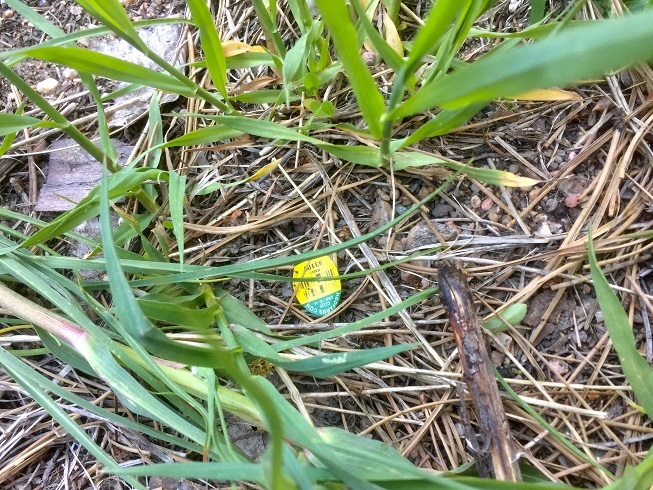 Another example of micro-trash that is commonly found: the fruit sticker. 4) Open your bar wrapper from the lengthwise seam. A common trash item is the serrated and shiny wrapper end or a portion of one. Bars can typically be opened from the center of this serrated end, where the glued seam runs lengthwise. Opening the wrapper here, parting the seam as you go, helps ensure the wrapper remains as whole as possible. Then, make sure the wrapper makes it way deep into your pack or into your handy doggie bag instead of a side or hip-belt pocket. Left: Lenore showcasing the end bit in question. Right: The suggested way to open a bar. 5) Be responsible for all aspects of your climbing tape. When taping up, it’s easy for a lip to form on the roll itself, and it’s also incredibly tempting to remove the lip and flick the sticky loop into the bushes. It’s also common to remove old tape and crumple it into a tiny ball. Too, old tape gloves shred apart, and finger or thumb loops become easy trash. Be mindful of these things! If you’re wanting to move away from all the tape hassle, reusable crack gloves are now a common alternative. 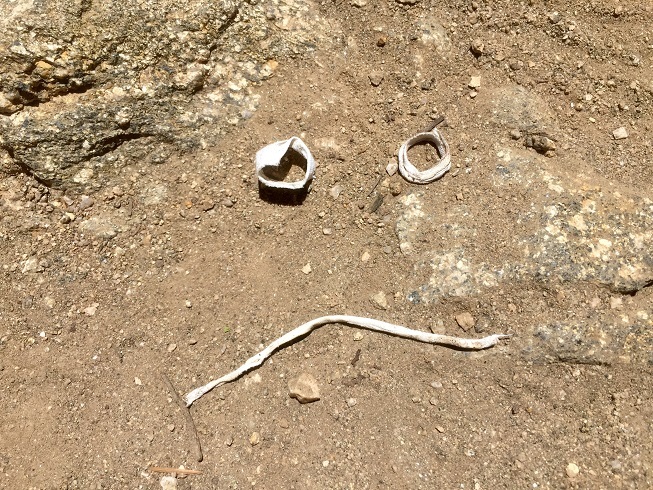 Climbing tape left behind is sad climbing tape. 6) Close your chalk bag as often as you can. 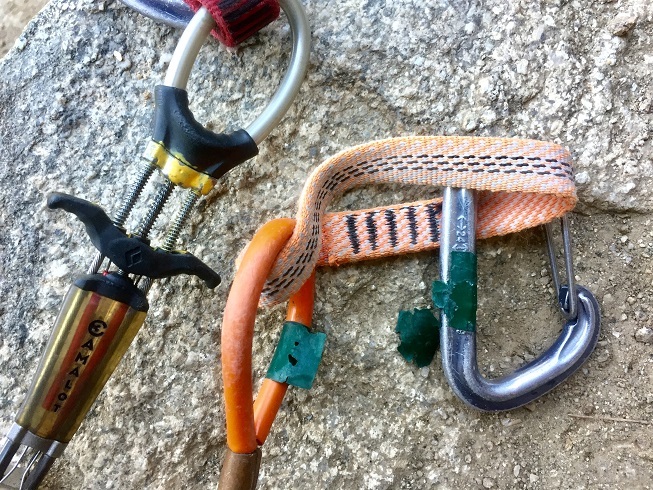 When you finish a route, rappel, or are just hanging out at the base, make an effort to keep your chalk bag closed. It’s easy for wind or circumstance to tip your bag and spew chalk. Chalk spills are not only an eyesore but the magnesium carbonate we use is a processed mineral, and thusly foreign to the soil and surrounding ecosystem. The unfortunate chalk spill with larger debris. With these six steps, you’re on your way to bettering the crag experience for everyone, even if only in miniscule ways—you’re still actively participating in Leave No Trace, in your own self-awareness, actually, and in polite consideration of others. 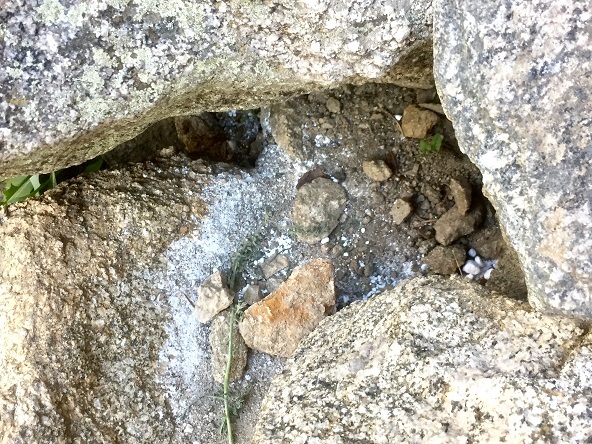 I’m sure there are other variants of micro-trash that occur at the crag, so if you think of one not mentioned here, add it to the comments below, to your mental list, and instigate a solution. Upholding Leave No Trace is a can of worms, but a worthy one. Sara Aranda has a B.A. in Creative Writing and is a freelance writer and gear tester currently based on the Front Range of Colorado. Trail running, climbing, and accumulating too many notes all dominate her life. 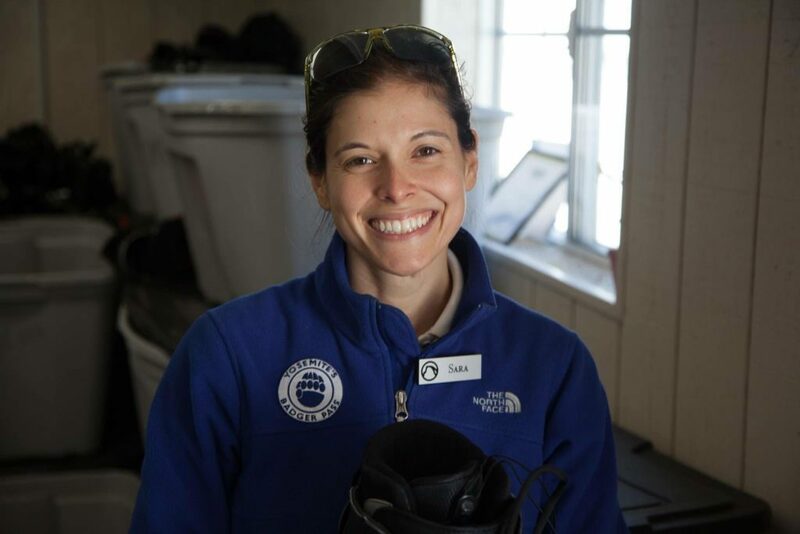 Her work has been published in Alpinist, The Climbing Zine, the Boulder Weekly, The American Poetry Review, and online with Misadventures Magazine, among others. Visit her site BivyTales.com or follow along on Instagram, @HeySarawrr. Another substitue for the doggie bags, is using any plethora of small plastic bags that come with packaging, like your climbing gear when you buy it. Collect the bags and just throw them in your packs. Macro and micro trash has become such a problem in the Lake Tahoe/Sierra Nevada area that nearly every day we get out, we can fill one of these bags on the way out or back from the crag. Force yourself to do the garbage duty a time or 2 and it will become annoyingly addicting…you won’t be able to walk by trash on the trail without stopping ever again! Another alternative is the bags from the grocery store produce department. They hold a lot (probably too much) and don’t weigh much.